Profit Maximiser is the successor to Bonus Bagging and is considered to be one of the first matched betting sites of it’s kind. Bonus Bagging was a huge success and showed users how to make a guaranteed profit from bookmaker signup bonuses and free bets. Profit Maximiser is a revamped version of Bonus Bagging with more features, more tools and shows you how to make more profit. Both Profit Maximiser and Bonus bagging are products from Mike Cruickshank. Mike launched Bonus Bagging in 2010 and saw huge success with it. 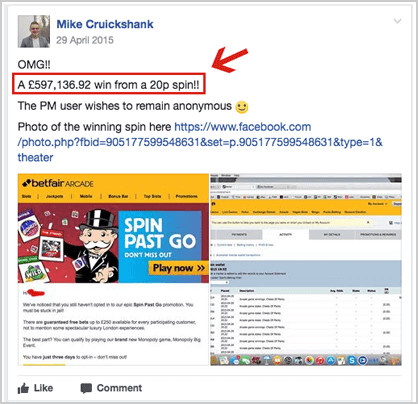 At a one-off fee of £27, Mike Cruickshank promises users hundreds of pounds of profit using matched betting. It’s no surprise Bonus Bagging was a success as it works. However, Bonus Bagging only showed users how to make a profit from bookmaker sign up bonuses and with very few reload offers listed and so once all of the signup bonuses have been completed, your profit dramatically slows down. That’s not to say that it isn’t worth the £27 he is charging as you’ll easily make that back along with hundreds more, but matched betting is about making a long-term profit, after the signup bonuses have been claimed. That is where Profit Maximiser comes in. Profit Maximiser is Bonus Bagging with the addition of reload bonuses and additional matched betting tools to help you make a profit every month and not just in the short term. Launching in 2013, ProfitMaximiser.co.uk has grown to become one of the biggest matched betting communities online. In this review, we’ll take a look at what Profit Maximiser offers to its users and compare it to some of the other top matched betting sites. Sign up to Profit Maximiser for only £1 today! Profit Maximiser costs £97 + VAT per year for the use of their service. They also give the option of a £1 trial for 14 days for people who are unsure on whether or not to part with over £100 before seeing what the service offers. £97 + VAT works out at just under £117 for the year which isn’t they cheapest annual subscription to a matched betting site but it also isn’t the most expensive. We would like to see a monthly subscription option but the £1 trial should give users enough of a taste of what Profit Maximiser offers before diving in with an annual subscription. The £1 trial gives full access to the service and should give enough time to get to grips with how ProfitMaximiser.co.uk works and make you a couple of hundred pounds. It is worth noting that if you opt for the £1 trial and you do not cancel your membership within 14 days, your account will auto-renew for the annual subscription of £97 + VAT. When you visit ProfitMaximiser.co.uk you land on a long sales page which promises you a guaranteed risk-free profit and financial freedom. It’s a different approach to marketing compared to other matched betting sites but something that obviously works for them. The video on the homepage starts automatically and you’re greeted with Mike Cruickshank himself showing you testimonials from current Profit Maximiser members and how much profit they have made over the past 12 months. The video and the sales page don’t actually show you any of Profit Maximisers features or the members’ area and so I expect most of their customers come from recommendations from sites such as this. If you get through all of the sale spiels you will see two buttons to sign up for either the £1 14 day trial or the annual subscription of £97 + VAT. We signed up for the annual subscription and were directed to Clickbank to make the payment. Once you’ve made payment you will be emailed your log in details to get started. Once logged in to your account, you are to complete 3 steps to get started. Step 1 is simply to make sure the emails you receive from ProfitMaximiser.co.uk will reach you. Step 2 opens up a training video which has Mike Cruickshank showing you various places around the internet on where to find the best reload offers. The video is a very long watch at 1 hour and 15 minutes and is not really aimed at beginners of matched betting but it does contain some useful tips to profit more from matched betting. And step 3 is to join the Profit Maximiser Facebook group. The Facebook group is a fundamental part of Profit Maximiser as this is where the members discuss offers and post offers they have found themselves. The layout of the members’ area at Profit Maximiser is very good with the main sections of the site listed in the top navigation bar. A big ‘Start Here’ button opens up a page with 6 steps to follow to get started with Profit Maximiser. Profit Maximiser advises you to watch the training videos before starting any matched betting. The videos section consists of 13 videos and are a mixture of bookmaker offer strategy and casino offer strategy along with guides on how to use the odds matching software and matched betting calculator. The videos seem to explain the strategies well and show Mike Cruickshank using the Profit Maximiser tools to complete some of the signup offers. 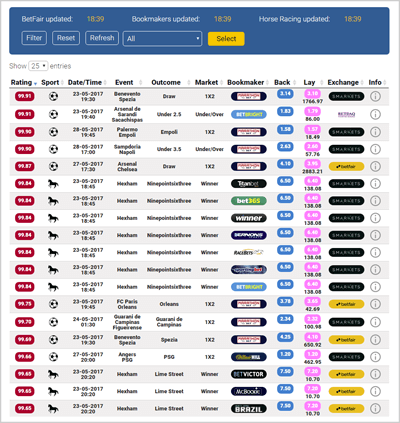 The bookmaker offers page displays the offers in grid form. 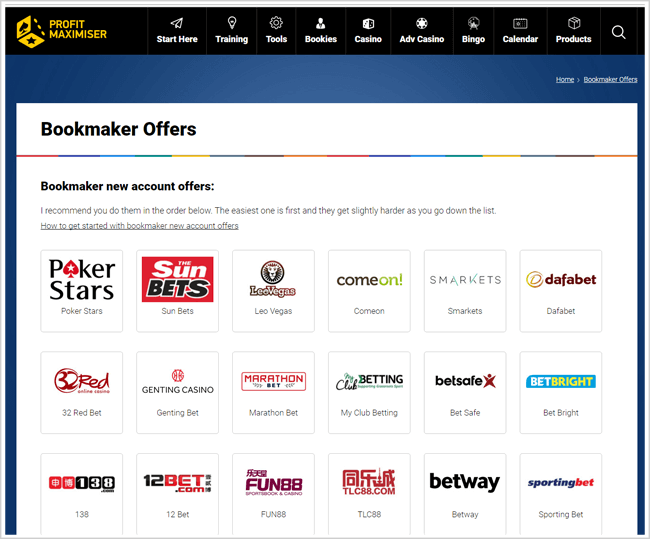 You may notice that a lot of the more popular bookmakers such as SkyBet, Ladbrokes, Coral and William Hill to name a few, are missing from the list and this is because you have to click on the ‘Bonus Bagging bookies’ list at the bottom of the page to view them. I suspect that the majority of ProfitMaximiser.co.uk customers were previously customers of Bonus Bagging and therefore they have taken the bookmakers used on Bonus Bagging out of the main list on Profit Maximiser as the members will have most likely have already completed them. However, if you are new to matched betting and haven’t used Bonus Bagging previously, it is a shame that these offers have been excluded from the main list as they don’t provide guides on how to complete them. Each individual offer page goes through the steps to complete the offer from placing your qualifying bet to making a profit with your free bet. The offer guides don’t contain any offer-specific videos but the text guides are written adequately enough to guide you through the offer. Once you have completed an offer you can click the ‘completed offer’ button which displays a tick next to that offer to keep track of completed offers. There are also sections for Casino offers, advanced casino offers and bingo offers. Try Profit Maximiser for only £1 today! EV Maximiser | Cost £ 49.99 + VAT – Shows you how to calculate the ‘Estimated Value’ (EV) for casino bonuses. It also contains information and guides on various types of casino bonus strategies. Bonus Bagging | Cost £27 – Shows you how to make a guaranteed profit from bookmaker sign up bonuses. Basically a more limited version of ProfitMaximiser.co.uk. Bookie Blowout | Cost £99.97 + VAT – With Bookie Blowout you’ll receive up to 5 emails a day from Mike Cruickshank with horse racing picks of which he thinks have been priced too high at the bookmakers which you then back and lay when the odds have shortened. Each Way Sniper | Cost £47 + VAT – A tool which identifies value each way bets on horse races. It displays the value bets in a table similar to the odds matcher and shows you which horses to bet on each way and how much to lay that bet to make a guaranteed profit. Matched Betting Software | £1 trial / 30 days, then £98.97 + VAT annually – This is an enhanced version of the odds matcher currently available to Profit Maximiser members. It displays odds in real time, meaning you don’t have to click the refresh button to see if odds have changed. It also includes in-play odds, channel 4 racing software and additional sports such as greyhounds, snooker, tennis and American football. Accumulator Generator | Cost £1 trial / 30 days, then £99 + VAT annually – An accumulator tool which generates profitable accumulators to be used with ACCA refund offers to guarantee a profit. You can read our full Accumulator Generator review here. Betfair Alliance | Cost £1 trial for 30 days then £99 + VAT annually – Lets you place bets on Betfair Exchange directly from your Profit Maximiser account without having to visit Betfair. Betting Mastermind | Cost £688 + VAT – This is the ultimate Mike Cruickshank package which includes all of the products above as well as a few extras thrown in. The odds matcher tool on Profit Maximiser is the same one that is used at Bonus Bagging. In fact, you are actually redirected to the Bonus Bagging website when you open it. The odds matcher automatically displays and ranks events by a rating score which is the percentage of your bet you will keep when backing and laying on that event. There are currently only football and horse racing events included in the odds matcher and as mentioned above, there is a more advanced odds matcher available but it does come at an additional cost of £98.97 + VAT a year. Filter options are limited to just bookmaker and min and max odds which is slightly disappointing as we would like to see some other options included such as filter by sport, event time and betting exchange. Clicking on the ‘Info’ button next to an event opens up the matched betting calculator which is configured to that specific event. From here you can view your back and lay stakes to complete the bet. At the beginning of October 2017, Mike Cruikshank released an add-on to the odds matcher which allows users to place bets on Betfair Exchange directly via their Profit Maximiser accounts. 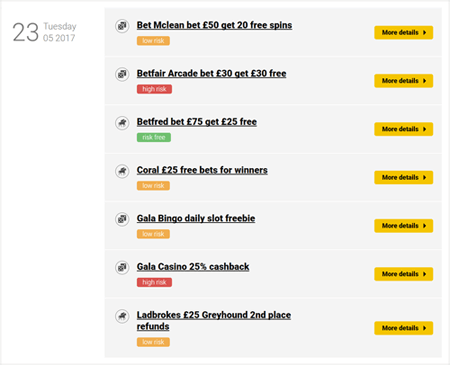 We’ve seen this feature rolled out initially by OddsMonkey a couple of months prior and it’s good to see other matched betting services follow suit and develop new and helpful tools. The odds matcher add-on is named ‘Betfair Alliance’ and is available to purchase at an additional cost of £99 + VAT per year. However, if you visit the sales page, you can test Betfair Alliance out in full for 30 days for only £1. There are two ways to access the matched betting calculator. The first is from the ‘tools’ section in the main menu. This opens up a basic calculator which allows you to calculate your back and lay stakes for basic matched betting offers. Unfortunately, the calculator lacks advanced features for the various offer types and only have settings for ‘stake returned’, ‘stake not returned’ and ‘qualifying bet’. The other way to access the calculator is through the odds matcher. Clicking on an event opens up a pre-configured calculator which is designed slightly differently but has the same features. We’d like to see more options on the calculator tool. Maybe this is something that again is included in one of the upgrade features but really should be as standard. The daily offers calendar is a very nice feature on ProfitMaximiser.co.uk. It displays all of the sports and casino reload offers that can be completed each day. There are a good number of offers listed each day allowing users to consistently make a profit. Each offer has its own page which explains the details of the offer and provides a link to the associated thread in the Profit Maximiser Facebook group. This is great if you are unsure about anything in the offer as you can ask the community and expect a reply pretty quickly. Mike Cruickshank promises lifetime support via email but I expect the route most members go when they have a question is the Profit Maximiser Facebook group. The Facebook group consists of thousands of members who are more than willing to help each other with questions they may have when starting out or assistance with completing specific offers. The Facebook group is also a way for members to share their success stories with matched betting and Profit Maximiser and on several occasions, members have posted screenshots of life-changing winnings. Back in April of 2015, a Profit Maximiser member won a staggering £597,136.92 jackpot on the ‘Chests of Plenty’ slot at Betfair Arcade from just a 20p spin. Then in December of 2016 another Profit Maximiser member won over £200,000 on the Double Bubble slot at JackpotJoy whilst completing one of the offers listed on ProfitMaximiser. Although these level of wins are few and far between, it does give other members hope that they too will hit a big win and a good incentive to keep matched betting. The Profit Maximiser group is private and when you sign up as a member you must send an email to [email protected] to request an invite. The main pages of Profit Maximiser are all optimised for mobile devices. This includes the training pages and the offer guides. However, the tools such as the odds matcher and calculator are not. This makes it very difficult to use Profit Maximiser to its full potential on your mobile phone. You may get away with it on your tablet depending on the size but it still may require some zooming in. Overall, Profit Maximiser is not intended for use on a mobile device so if you are looking to matched bet on the move, you may be better off choosing a fully optimised matched betting service. Profit Maximiser offer affiliates 75% commission on any customer they refer. Considering the price of the subscription is almost £100, you will earn around £75 per referred member. This is a great opportunity for members of Profit Maximiser who believe in the product, to earn a bit extra by referring their friends and family. However, you don’t need to be a member to become an affiliate. Simply sign up to Clickbank and replace ‘xxxx’ in the following link to your Clickbank ID ( https://xxxx.bonusbag.hop.clickbank.net?x=12 ). Profit Maximiser has an excellent community on Facebook where members help each other out throughout the day with offers and general matched betting queries. Having a community like this is what makes Profit Maximiser so popular. However, in terms of the tools and features they provide, they are lacking slightly. There are some excellent tools on offer from Mike Cruickshank but unfortunately, they all come at an extra cost. Some of which are not exactly cheap. If Profit Maximiser could include these tools in the regular subscription then they could be pushing for one of the best matched betting sites.